These tough and enduring little circular locks have become a staple of mini storage properties, who want to market advanced security features to their concerned tenants. Whereas regular padlocks leave your storage unit vulnerable to bolt cutter attacks. Bolt cutters are like giant scissors that make very short work of the standard curved bolt found in most normal padlocks. The problem arises when your mini storage property isn’t very well secured or overseen. Anyone that already has permission to come onto property, such as a current tenant, can simply walk up and down the line of storage units, merrily snipping open the ones they want to go shopping for free in. If your property manager isn’t paying attention, then you can bet you are going to feel the hurt pretty soon when you show up to your now empty storage shed. Chateau circular disc locks make this sort of thing very hard to do. You just can’t cut them using regular bolt cutters. I’ve tried. It’s not pleasant for the person trying to get through the lock. The reason you can’t use standard bolt cutters to open a circular disc lock is that only a small portion of the bolt is exposed in the first place, and it is extremely hardened, compared to normal padlocks. There’s not only much room for your bolt cutters to get a purchase on the disc lock but there’s simply not much they can do even when you do have them right on the money. Now, it is true that there are several different ways to defeat these advanced locks, but these methods are unwieldy and most of them would cause the kind of commotion that would get a would-be robber nabbed by the cameras or manager. An angle grinder can make fairly short work of circular disk locks, but angle grinders require power, meaning your thief would need to jack in to an outlet somewhere, unless he wants to run a gas generator from the back of his thief-truck. Not likely. Angle grinders also produce a good amount of sometimes very hot sparks, so your thief will have to be prepared with proper eye protection. Not to mention that there are certain blade types which are far more effective than others at opening these high security Chateau disc locks. The point is that your angle-grinder wielding thief would not be winning any awards for subtlety. Sometimes, depending on the positioning of the disc lock on the shed door, it can still take a couple of minutes of straight grinding for a robber to get clear through the lock, even if they know where it is weakest. The other method for undoing a disk lock involves skill and knowledge. These locks can be “raked” open by a knowledgeable amateur locksmith using little more than a homemade tool and a lockpick. Once you have an understanding of this method, it is quick and relatively easy to pop the lock open, but it does require an understanding of where to apply pressure and how to coax the disc lock into releasing. What makes this method a higher risk to the average mini storage customer is that it is virtually silent and can be done quite quickly by someone proficient in the technique. Should your storage shed be out of the reach of the watchful eyes of cameras, you could be at risk of a raking attack. This is why back-up self storage security systems become so essential. Even if your thief gets past your manager, the cameras and through your disc lock, a good mini storage property will have individual unit alarms that know the person opening your unit could not be you, since you never coded into the gate. You may notice self storage managers upselling these specialty locks during move-ins or while you’re in the office taking care of business. These circular locks are likely to be more expensive than normal padlocks, but usually only by a few dollars. It’s well worth the small investment in some piece of mind if you’re at all concerned about the safety of your belongings inside your storage shed. 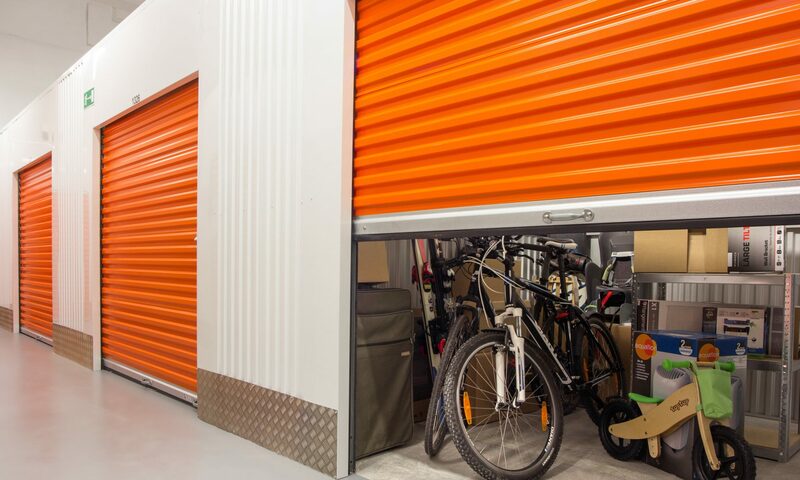 Some clever storage companies will run periodic specials, during which times they will offer you a free lock when you move-in. This is a nice perk, to be sure, but don’t be fooled. Usually if the company is offering you a free lock, you are more than paying for it somewhere else, be it some additional fees or a rate increase that is set to come down the pipes after you’ve been in your unit for a few months. Still, you have to appreciate the extra security where you can get it. Will a Chateau disc lock on its own prevent disaster from befalling your unit, or foil a dedicated crook that’s intent on getting into your possessions? Absolutely not. But with the combination of a good electronic gate system, a competent manager, surveillance cameras and high security locks backed up by individual unit alarms, you can rest pretty easy knowing that there are multiple layers of protection working together to keep your things safe and out of harm’s way. From a self storage manager’s perspective, the calculus of whether or not your should stock and sell these specialty disc locks is a little more complex. Everyone knows how constantly customers will come into the office complaining that they have lost their keys and need to get into their units. When your customers use normal padlocks, getting them back up and running is a snap – just pop their old lock off and sell or give them a new one. Unfortunately that’s not the case when you’re dealing with these high security circle locks. If you are the sole manager on property, a customer with a lost key means closing down the whole office, getting the appropriate gear and facemask, running multiple extension cables if you don’t have a nearby outlet, and then grinding away on a small object that is perfectly shaped so as to make it very easy for your angle grinder, now running at 7200 rpm, to kick outward, maybe toward your flesh. Some companies deal with this by telling customers that it’s their policy to schedule circle lock cuttings because they are so involved. They can’t be done right this instant. Naturally, self storage customers being the uniquely reasonable lot that they are, this may or may not go over well. Any decisions to stock and carry these circular disc locks must be weighed carefully. On the one hand, they can help you to increase your brand’s image by offering higher security. They can make your operation seem more professional and modern. This is all good and overtime should positively affect your revenue and market value in your area, especially against companies that do not offer disc locks for sale. On the other hand you have the lost time, risk of injury and general hassle of cutting through disc locks, which would seem, by some cruel trick of fate, to always be required either: right after you sit down to lunch, just before you close up to go home, just as you’re in the middle of a complicated move-in with a high paying client, or while there are other people accessing their units right next to where you need to make a pretty ugly spectacle of butchering what once seemed a secure lock with a high pitched whining machine of death that launches showers of hot sparks in every direction.